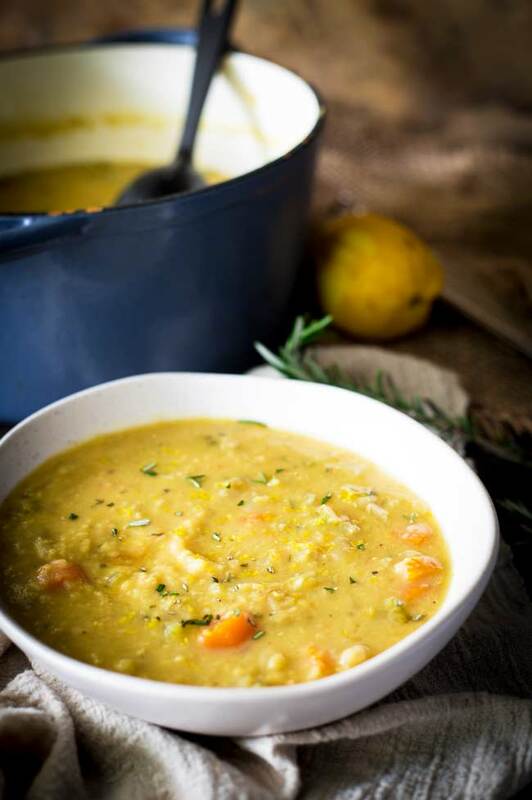 This vegetarian lentil soup with lemon and rosemary is a soup powerhouse! It’s healthy, can be cooked in the slow cooker (crockpot) or on the stove in a dutch oven and is so easy to make. What is more it is low carb and naturally gluten free. 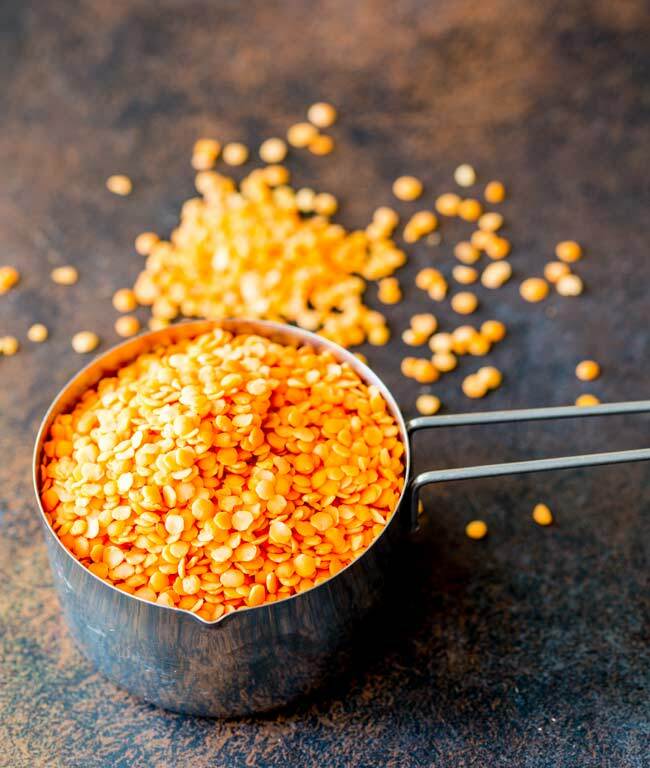 The lemon and rosemary gives it a freshness, whilst the blended red lentils and vegetables give it a rich creamy texture without the need for cream. Perfect for fall; serve this soup for lunch or dinner and don’t forget the bread and butter. Unless you are serving it up to your vegan friends, then skip the butter! first sauté off onions, carrots and celery. add red lentils, rosemary and vegetable broth. cook long and slow to allow the lentils to break down. add fresh lemon and more rosemary to boost the flavor. Can I use my slow cooker/crockpot to make lentil soup? I mean is there anything more comforting that coming home to a slow cooker full of delicious warming soup? I have given instructions for both stove top and slow cooker cooking. Do I need to cook my onions before adding them to the slow cooker? 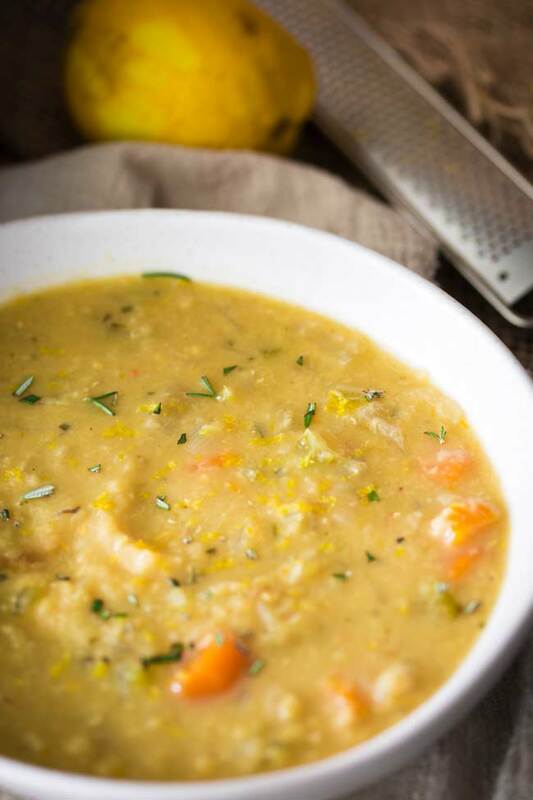 Is this Lentil Soup with Lemon and Rosemary healthy? It sure is!!! And that is what we want to hear! I mean everyone loves a bowl of healthy lentil soup cooked in the slow cooker! A nice large bowl of this soup will only cost you 278 calories and because of the lentils this is a really filling soup. Is this Lentil Soup gluten free? 100% yes! There are no thickening agents in this lentil soup, the red lentils and vegetables do all the work for you so that makes this naturally gluten free! It is sure is! Everything is plant based in this soup, making it perfect for vegetarians and vegans. Just be sure to check your stock. I specify vegetable broth in the recipe and whilst I have never seen a vegetable broth that isn’t vegan you just never know. Especially when you thinks that they sometimes use fish to clarify wine (yes really!!! )…you have to wonder about other seemingly vegan ingredients. So to be sure just check your broth is vegan. Can the lentil soup be frozen? Allow the soup to fully cool before placing it in the freezer. If using a container don’t overfill it. Water expands as it freezes so make sure you allow some room for this expansion. Make sure you label your bags/containers. Once frozen this is almost impossible to distinguish from chicken and lentil stew or frozen gravy. And you don’t want to get the wrong one out for dinner! I don’t want to freeze it, but how long will the lentil soup keep in the fridge? This lentil soup tastes even better the following day! But I wouldn’t keep it more than 3 days in the refrigerator. And as with all leftovers ensure it is piping hot before you serve it. For other delicious, warming and comforting soups, check out my Spiced Coconut Potato Soup (also vegan), my French Shrimp Soup (which is low cal and so easy to make) or why not try This Roasted Red Pepper Soup from Emily over at Inside the Rustic Kitchen. 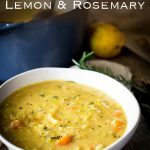 Why not pin this recipe for Lentil Soup with Rosemary and Lemon. Pin it here. This vegetarian lentil soup is healthy, easy to make and can be cooked in the slow cooker/crockpot. Plus it is low carb and naturally gluten free. 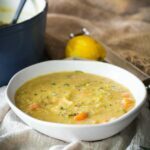 The lemon & rosemary gives it a freshness, whilst the blended red lentils & vegetables give it a rich creamy texture without the need for cream. Perfect for fall; serve this soup for lunch or dinner and don't forget the bread & butter. Unless you are serving it up to your vegan friends, then skip the butter! Peel and finely chop the onions, carrots and garlic. Wash the celery stalks and cut them in half lengthways. Then chop the long sticks into small dice. Pour the olive oil into a large fry pan and once hot, sauté your onions over a medium heat for 3-4 minutes until softened and starting to lightly colour. 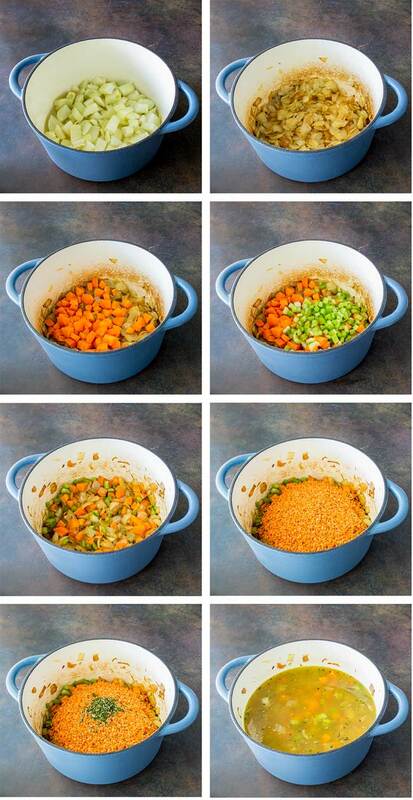 Add in your carrots and celery garlic and cook for a further 3 minutes. Stir in the garlic and cook for another minute. Add the vegetables, red lentils, 2 tsp of the fresh rosemary and vegetable broth to the slow cooker and cook on low for 7 hours or high for 4 hours. Give your soup a vigorous stir to create a creamy texture and then add in the seasonings, the zest of the lemon and the additional teaspoon of fresh rosemary. You can blend it at this stage if you wish. Serve immediately or set to keep warm. To cook on the stove. Pour the olive oil into a large stock pot and once hot, reduce the heat and sauté your onions over a medium heat for 3-4 minutes until softened and starting to lightly colour. Add in your carrots and celery garlic and cook for a further 3 minutes. Add the red lentils to the pan along with 2 tsp of the fresh rosemary and vegetable broth. Cook over a low heat for 40 minutes until everything has softened. 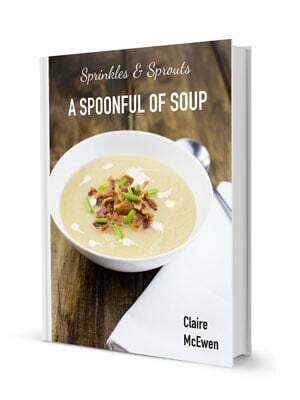 Give the soup a stir every now and then and once it has finished cooking stir it vigorously to give your soup a creamy texture. Finish the soup with the seasonings, the zest of the lemon and the remaining fresh rosemary. Fresh rosemary really is king here, but if you only have dried add just 2 tsp of dried to the soup before you cook it and then skip the rosemary garnish. Although sautéing the vegetables before putting them into the slow cooker means dirtying another pan, the flavor it gives your soup is so worth it. But if you are short on time this step is optional. 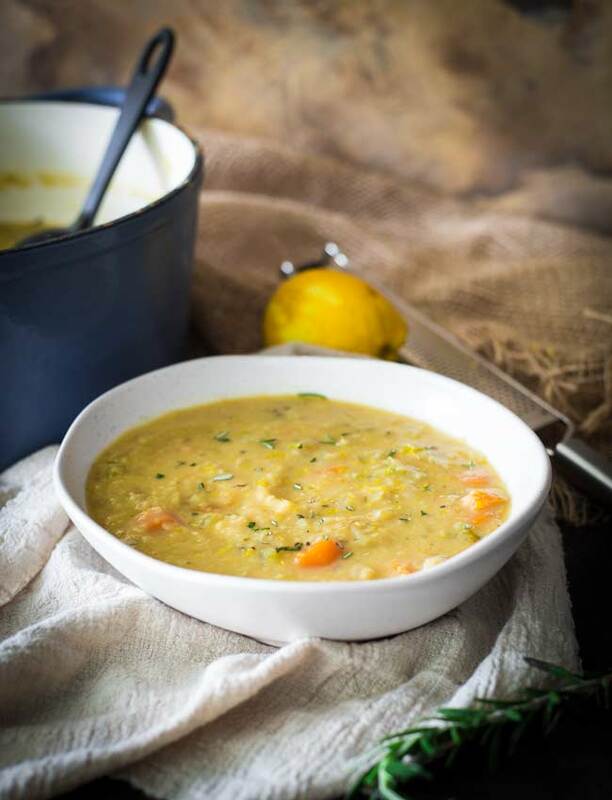 If you love food why not subscribe to my newsletter, I will drop you an email every now and then, just to say hi and send you a couple of recipes I think you might love, like this Lentil Soup with Rosemary and Lemon. Do you add lemon juice or just the zest? I’m making this right now. Hi Christine, I just use the zest and then cut the lemon into wedges so people can add it at the table if they like. They cook quickly so don’t need soaking for this dish. Do you only use the lemon zest, not the lemon juice? Would this recipe work in the Instant Pot? I haven’t tested it in the instant pot, but I would think so. This sounds so good…. and the fact that its naturally creamy with out the dairy creamer to make it creamy makes it a MUST MAKe in my life! I can hardly wait to try it, the lemon add it sounds like the perfect brightener for lentil Soup! I love making lentil soup and this was the best recipe yet! This looks so easy and delicious! My family will love this! Lentil soup is perfect for upcoming fall weather! I love that it is made with Lemon and Rosemary, that combo is perfect together! So comforting! Mmmm…This delicious, cozy lentil soup has all my favorite flavors! I love how simple it was to make. Even my mother asked for this recipe. I’m definitely making this again! Thank you for passing it on to your mother….I hope she loves it too. Oooh, I love lentil soup! This recipe is a winner! Thank you Liz, it really is yummy isn’t it.